Gimpel Fils announces an exhibition of work by the Outsider painter, Scottie Wilson (1888 - 1972). Scottie Wilson (usually referred to as 'Scottie') was born into poverty in Glasgow. After serving during World War I, he emigrated to Canada. There he opened a second-hand shop which sold, among other things, fountain pens. In 1944 he started using these as a tool to doodle on cardboard, an activity which occupied more and more of his time. Eventually his work was included in group gallery shows, but Scottie didn't want to sell. He tried organising touring shows, charging modest entry fees. Despite growing recognition in Canada, in 1945 Scottie returned to the UK and settled in London, where he continued to organise his paying exhibitions. Though wary of the art trade, from time to time he was induced to show in a commercial art gallery. Gimpel Fils held its first Scottie Wilson exhibition in 1949. On the opening evening, Scottie turned up late for his vernissage, having repaired to a nearby pub in South Molton Street where, portfolio of drawings in hand, he offered the customers a chance to buy the work of 'an artist' for a fraction of what a 'posh' Mayfair gallery was charging further up the street. In the 1950's, Scottie was invited to Paris by the celebrated French artist Jean Dubuffet. Dubuffet was an admirer of Scottie, as was Picasso and both artists collected his work. Dubuffet's significant collection of Art Brut, his own term, was donated to Lausanne and is now in a public museum. In the 1960's, Royal Worcester commissioned a series of dinnerware from Scottie and these proved popular. 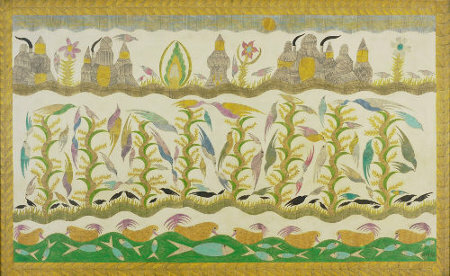 Although not an exclusive concern of Outsider Art, there is a recurring moral theme to be found within this movement and Scottie's own contribution is his manichean view of the world, where his 'greedies' are juxtaposed with positive symbols of goodness, usually in the form of nature. Very good examples of this theme are included in Gimpel Fils' exhibition, all drawn from the gallery's collection and including the largest pen drawings the artist ever produced.